WHAT IS A NOTICE OF DEFAULT? WHEN DO THE BANKS SEND THEM? WHAT DO THEY MEAN? WHO CAN HELP ME? Once the Notice of Default is recorded, the foreclosure time frame begins. This is technically the foreclosure starting point, and the beginning of the legal length of time to foreclose in California. California foreclosure law says that within 10 business days after recording, a copy of the recorded Notice of Default is sent by certified and regular mail to the borrowers at any addresses provided and any recorded special requests. After no more than 30 days, a copy of the Notice of Default is sent by certified and regular mail to new owners and all junior lien holders to the Deed of Trust being foreclosed. A Trustee’s Sale Guarantee Report is ordered from the title company providing all title information. 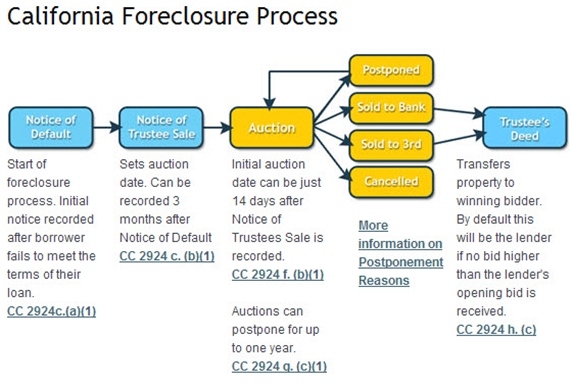 The foreclosure sale, or Trustee’s Sale can be formally scheduled 90 days after the NOD is filed. And the Foreclosure Sale Date can typically be no shorter than 21 days, (with some variances). recordation appears on this notice). and will increase until your account becomes current. paid all senior liens, property taxes, and hazard insurance premiums. in order to cure your default; or both (1) and (2). governmental agency which may have insured your loan. prior to the conclusion of the foreclosure. the bank or Beneficiary or Mortagee of your loan can schedule a Trustee's Sale Date to sell the property. This entry was posted on Thursday, March 3rd, 2011 at 10:54 am	and is filed under California Foreclosure Law, Sacramento Short Sale and Sacramento Foreclosure News. You can follow any responses to this entry through the RSS 2.0 feed. Both comments and pings are currently closed.